From small artisanal growers to major wine companies, an increasing number of grape and wine producers throughout New Zealand are making the transition to certified organic production. The reasons for doing so are diverse: a desire to take better care of the land; a passion to craft a premium quality wine from the ground up; a drive to achieve a highly respected environmental accreditation. Organic winegrowers aim to cooperate with nature, working with ecological processes and using only naturally derived products, avoiding the use of synthetic fertilisers, pesticides, and herbicides. But as a grower, where do you get started? Is organic production possible for everyone? What are the steps to take a vineyard into organic production? What to do about weeds? How to prevent disease outbreaks before they occur? How do the outcomes of organic production stack up against conventional growing methods? And what does it all cost? The Organic Focus Vineyard Project was set up to shed light on all of these questions. For the years of the 2012, 2013 and 2014 vintages, Organic Winegrowers New Zealand, with funding from the Sustainable Farming Fund and New Zealand Winegrowers, conducted this three-year project to document and demonstrate the realities of organic production. 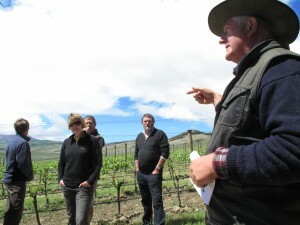 Three prominent wine companies, in three diverse growing regions – Wither Hills in Marlborough, Gibbston Valley Wines in Central Otago, and Mission Estate in Hawkes Bay – provided vineyard sites for the project. At each focus site, the vineyard was split into two side by side blocks: one to be managed according to standard industry practices, and the other to be converted to organic production. Each focus vineyard featured two grape varieties characteristic of its region. Professional organic viticulture consultant Bart Arnst provided advice to the focus vineyard managers as they converted half of each focus vineyard site to organic management. Meanwhile, local conventional growers consulted to ensure that standard best practices were used on the conventional half of each focus vineyard, as appropriate to each region. The project included a detailed monitoring program as well. Financial operating costs, pest and disease incidence, soil structural and biological health, soil moisture, grape yields, and fruit and wine quality are being monitored at all of the focus vineyards. Results of this monitoring provide direct comparisons between organic and conventional vineyards operating side by side. Independent research technicians from Fruition Horticulture and the National Centre for Sustainable Agricultural Technologies undertook the monitoring and data analysis in order to ensure reliability of the data collected. 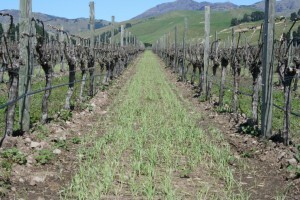 The project was piloted in the 2010-11 growing season at Mission Estate’s home vineyard in Hawkes Bay; to read reports from that vineyard, see the pilot project blog.